Transportation Alternatives has expanded on the RPA’s modest call for a pedestrianized few blocks of 14th St.
There’s been a low-level drumbeat, sometimes crescendoing, over the past decade regarding Manhattan’s river-to-river cross streets. Vision42, an on-again/off again advocacy group, has long pushed for a car-free 42nd Street devoted to light rail and people, and a plan put forward by the Bloomberg Administration and doomed by recalcitrant Community Boards would have converted 34th St. into a Transitway primarily for the benefit of tens of thousands of daily bus riders who use this popular corridor. Now, the looming L train shutdown may give advocacy groups and the city a third bite at the crosstown apple. Although the L train shutdown isn’t likely to begin before 2019, the MTA has to announce its plans later this year, and various groups are jockeying for a voice at the table. Although I think the effects of the shutdown have been blown out of proportion, the city’s and MTA’s options for dealing with the shutdown are both obvious and limited, as I explored in January. I offered then a seven-point plan to address the shutdown including expanding all nearby and connecting subway service while turning the Williamsburg Bridge into a bus-only route, and now Transportation Alternatives has taken this idea one step further. Building on a proposal from the RPA, the TA wants 14th St., from river to river, to be a peopleway, both during the L train shutdown and after. The RPA’s plan is far too modest, and it’s obvious the problems that would arise by closing just an avenue and a half to cars. But a river-to-river repurposing of 14th St. during the L train shutdown, as the TA has proposed, would be truly transformative. Buses would run frequently and smoothly along the path of the L train, and the MTA and DOT could reconfigure peak-hour routes off of the Williamsburg Bridge and up or down 1st or 2nd Avenues to provide a busway from Brooklyn as well. It’s no small task to implement an idea like this. Residents concerned primarily with door-to-door private car access who suddenly forget how to walk a block or two have been loud, vocal opponents of these types of ideas, but at some point before 2019, the city is going to have to do something to address the mobility challenges and L train shutdown will bring. A Peopleway is a prime opportunity to show this idea — handing city streets over to transit and pedestrians and bikers — can not only work but be very successful. Business owners along the route who recognize that their customers walk and use transit are on board. Now it’s up to the city to join the plan. If, or when, it works, the Peopleway is an idea that could just stick around for a while. As a new experiment in underground retail space opened on Tuesday, a question I never really thought I would ask crossed my mind: Will New Yorkers stop in the subway to buy artisanal mini doughnuts? It’s very much a question of the moment, but with Goldman Sachs fronting over $11 million for Columbus Circle’s TurnStyle, the first privatized retail concourse in the subway system, there is a lot riding on the answer. TurnStyle has been in the works for years. It’s the brainchild of Susan Fine, a principal at OasesRE who has overseen the rebirth of retail spaces in both Grand Central and Rockefeller Circle, and it was originally supposed to open last year. But time is a fleeting concept when it comes to MTA projects, and TurnStyle, a 30,000 square foot market outside of fare control and underneath 8th Ave. from 57th St. to around 59th St., opened yesterday. Before the renovation to the Columbus Circle, this passageway was a bit forlorn with a few uninspiring shops and empty spaces. The MTA booted everyone out seven years ago, and now, after a $14.5 million private investment that included a $8.7 million construction loan and a $3.6 million equity investment from Goldman Sachs, the space reopened with a veritable New York 2016 feel. Whether you find that to be a positive or a negative is an inherently personal conclusion. So what is this thing called TurnStyle anyway? It has a cute name and 39 retail spaces, including 20 that the company is calling “gourmet eateries.” It features takeout windows, like the doughtnut shop, and sit-down joints, ranging from sushi to pizza to crepes to grilled cheese. Eater has a full rundown of the food spaces. There are retail and pop-up spots that included a clothing boutique and a hat store, and of course, there’s a Starbucks, a florist and a wine shop for when you need to grab that bouquet and a bottle on the way to the D train. The question is: Will it work? It helps that Columbus Circle is the seventh busiest subway stop in the city with 23.3 million entries last year. Located at a popular spot for workers, residents and tourists, the built-in audience is tremendous. Plus, the spot looks good. With better lighting and fixtures, it’s brighter and cleaner with colorful tiles and digital signs. Even those subway riders who didn’t know about it stopped to note the environment last night. It could be a model for other underused open spaces in the subway — so long as these spaces can attract the right passenger volume. It’s possible then that TurnStyle works only because of where it is. It’s likely a model that could be implemented to great success in the concourse underneath 8th Ave. at 42nd St. and perhaps in a few other closed off areas of the subway (such as the passageway under 6th Ave. in the upper 30s or between 7th and 8th Avenues underneath 14th Street). It’s unlikely to work in, say, a G train station with wide and empty mezzanines because the foot traffic isn’t there. But for now, it’s a novelty and a well executed one at that. The MTA profits off of the rent, and Fine and her partners draw in revenue as well. It may not be an all-encompassing solution to the dreariness of everyday subway riding, but it’s a brighter spot in one corner of the New York City subway system. Upper East Siders stalled this project for four years over the location of one entrance. A whole bunch of years ago, back in late 2011, I covered sort of an ugly story concerning Upper East Side residents who lived on East 69th St. and a classist and racist reaction to a plan to build a new entrances to the perennially overcrowded 68th St. stop on the 6 train. This plan is now back in the news, and although 68th St. will get its additional entrances and ADA-compliant accessibility, the NIMBYs have seemingly won and at a cost to the MTA — and taxpayers — to boot. A few months later, those same residents dug in and threatened legal action. They talked about the “pristine nature” of East 69th St. and the “bucolic” street that would be ruined by a new subway entrance. The dog whistles could not have been more deafening, but their tactics worked. It’s four years later and only now is the MTA getting ready to make the 6 train station accessible and with more entrances — but at a cost. In last month’s MTA Board materials, the 68th St. station work resurfaced. By the MTA’s own admission, the project is four years late. Design work was supposed to be completed by April of 2012; instead, the agency expects to finish shortly. And why? In bureaucratic-speak, “this delay is due to additional time needed to address community concerns, raised by adjacent property owners at 69th Street regarding the location of the proposed street stair entrances.” In other words, NIMBYs have meant that thousands of subway riders — 68th St. sees 36,000 riders per weekday — have suffered through worse commutes for nearly half a decade. After extended negotiations, an agreement has been reached to place the stair entrance east of Lexington Avenue inside the Imperial House Apartments (between 68th Street and 69th Street). This entrance is in lieu of the street entrance at the Southeast corner of 69th Street and Lexington Avenue. The additional time is necessary to complete the property acquisition, environmental study, and additional design for the new work items. The costs of this project have increased by around $8 million to approximately $65 million due to the MTA’s need to acquire property that belongs to the Imperial House Apartments. It’s also still not clear what the final scope will be as compared with the 2011 plans. DNA Info recently reported that the MTA could still pursue those plans, but MTA sources tell me the Imperial House plan is essentially the only way this project moves forward as East 69th St. residents will throw up substantial legal roadblocks otherwise. Construction may start later this year and end in 2020, well over three years after this project was supposed to wrap. So did the NIMBYs win? I guess so. The project is more expensive and has been delayed, as MTA sources tell me, thanks to the back-and-forth between the agency and community groups. The scope will be reduced, and access to the station will be cut back by a half a block or so. It’s not nearly as encompassing as it was first proposed. But that’s what happens when a vocal minority of a community with resources bands together to fight something they see as intrusive. The rest of us suffer through worse transit options because of it. In an alternate universe where New York City politicians and planners aren’t afraid to take risks, yesterday was a big day for the M86. In this alternate universe, after a short planning process, Transit’s second busiest crosstown route, averaging 24,000 weekday riders, saw massive upgrades as the city opted to close Central Park’s 86th transverse to cars during peak hours, install a signal prioritization system from river to river, ensure bus bulbs and dedicated lanes were in place and generally treat the M86 as worth being a crosstown route over 30 blocks north of the nearest cross-Manhattan subway line. That’s not what happened. Instead, as part of the Mayor’s promise to call 20 routes “Select Bus Service” by some indeterminate time that was originally supposed to be the end of 2017, a bunch of politicians gathered on the West Side to celebrate the launch of the M86 SBS. After eight years of talking about it, the M86 got a pre-board fare system, multi-door boarding, a few queue jump lanes that are already drawing NIMBY complaints, those weirdly unappealing new forward signs that replaced the hallmark SBS flashing blue lights, and the promise of some bus bulbs. As part of the upgrades, every politician representing both the Upper East and Upper West Sides sent out a statement of support as though these upgrades are worth multiple rounds of back-slapping. In a moment of utter hilarity considering its taking nearly a decade to get here and the bus route was still late by a few weeks, State Senator Adriano Espaillat thanked NYC DOT for “quickly completing this project” while Jim Clynes, chair of Manhattan’s CB 8, noted that M86 SBS will have “a subway feel.” That everyone felt the need to gather in the first place is telling. What DOT and the MTA did with the M86 will represent massive improvements in travel time for crosstown bus riders. Dwell times — especially at key locations where the M86 intersects busy subway lines at Central Park West and Lexington Ave. — represented the single biggest challenge to speedy crosstown operations, and if the city isn’t willing to give buses dedicated road space during commuting peak hours, pre-board fare payment and multi-entrance boarding are low-hanging fruit that pay key dividends for those 24,000 daily riders. But these improvements are run-of-the-mill upgrades that are viewed as best practices for local buses the world over. The MTA didn’t eliminate any M86 stops; the bus still makes two stops on the same block of 86th St. between Columbus and Amsterdam Avenues. DOT didn’t reallocate street space except for some limited queue jump lanes that allow buses to get a hard start at red lights. So why the press conference? When I posed this question earlier in the day, a few of my Twitter followers suggested, perhaps cynically but also accurately, that these improvements wouldn’t happen at all if politicians don’t have the opportunity to grab camera space while trumpeting them. Sadly, this is true, but on the flip side, I wondered if these improvements wouldn’t be treated as revolutionary if 15 politicians didn’t insist on showing up to press conferences or sending out statements every time the MTA and DOT implement on one bus line what other countries consider to be system-wide best practices. Every crosstown bus should feature a proof of payment that allows for multi-door boarding, and such a system should be implemented as soon as the fare payment kiosks are installed, not eight years after the first Community Board presentations. Until we as a city and our politicians as our city leaders get over the need to have a press conference about something as mundane as a new fare payment system on one bus line and a few queue-jump lanes, we are doomed to watch our transit system die from a lack of Great Ideas and the will to implement them. Politicians should be asking “what took so long?” and “how soon can we get these improvements rolled out on the M79, M96 and M106?” rather than falling over themselves to congratulate the M86 for catching up with most of London’s regular bus service. Don’t slap a fancy name on these ops upgrades. Aim higher. Be better. When last we checked in with plans to rezone Midtown East and build up a new tower across the street from Grand Central, we delved into the fancy renderings of the transit improvements. The carrot of $200 million in badly needed upgrades to the Lexington Ave. IRT stop at Grand Central is a hard one to resist, and I’ve been supporting this project from the get-go. As my office is now a few blocks away, I’ve seen the Modell’s empty out, and the building be prepared to be replaced. Now, the effort is one step closer to reality as the city’s planning commission has approved the necessary rezoning. The whole project isn’t out of the woods yet as it heads to the full City Council, and the Council is sure to push for changes. But it seems more likely than not that we’ll get a tall building across from Grand Central and a far more pleasant subway experience thanks to it. More platform space, better passenger flow and easier access from street level all funded through developer contributions are all part of the deal. The biggest obstacle for the so-called Vanderbilt Corridor remains: Passage by the City Council, which is likely to push developer SL Green Realty Corp. to alter its plans for a 1,400-foot-tall commercial skyscraper…While de Blasio’s [rezoning] pitch has not met fierce resistance from community board members and local elected officials, it has been repeatedly attacked by the relatively unknown owner of Grand Central Terminal, Andrew Penson. …Specifically at issue, [Council member Dan Garodnick] said, will be whether the $210 million in work SL Green has committed to is enough to warrant the bonus the company will receive. “We just have to throw that onto the scale against a 30 F.A.R. building,” Garodnick said. To me, this is a potential model for future transit improvements, and the City Council shouldn’t ignore this reality. For the MTA, it’s a new model that encourages public-private partnerships and allows the MTA to fund work it wouldn’t otherwise have the money to perform. Especially at Grand Central — the second busiest station in the system — the dollars will have an immediate impact on a problematic customer experience. We’ll know soon enough what the future holds for this project, but after Community Board approval and a planning commission okay, it’s likely to pass the City Council in some form or another. The station improvements alone will be a welcome element. It’s hard to believe, but an entire generation of New Yorkers have come of age or come to a city without a Cortlandt St. subway station on the 1 train. For decades, Cortlandt St. fed Radio Row and then served as the West Side’s best access point to the World Trade Center. 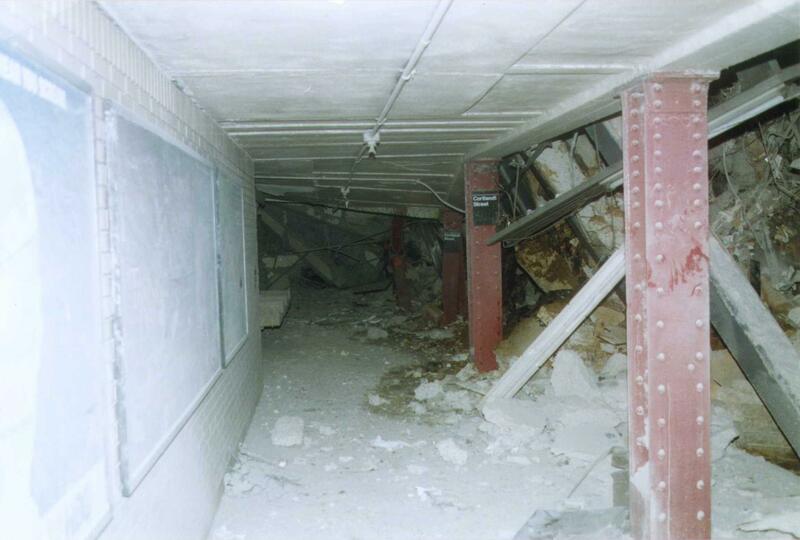 The station, though, was destroyed on September 11, 2001 and, as work has consumed Lower Manhattan over the past 14 years, it has remained closed since then. Based on recent MTA documents, it may still be a few years yet before the station reopens. In this month’s Board materials, the immediate fate of the Cortlandt St. station makes an appearance, and no, the MTA isn’t considering keeping it closed. As buildings grow at the World Trade Center site, the 1 train’s pass through Lower Manhattan remains a key access point for thousands of West Side and Staten Island commuters who will need transit service to their offices. The news concerns the MTA’s assumptions of a Port Authority contract for work at Cortlandt St. The details of the politicking are rather mundane. Essentially, Cortland St. had to remain closed while the Port Authority rebuild the Ground Zero site, but the MTA and Port Authority have struggled to coordinate work and finalize cost-sharing arrangements for the repair of the subway stop. A few years ago, the Port Authority issued an RFP a key construction contract with the work split into two phases. Judlau won the bid, but it’s been slow going. Phase 1 was the easier part. It was a $20 million for structural and demolition work, and it’s nearly complete. Phase 2 was supposed to be around $69 million, and it included a variety of systems work and a complete station fit-out. Work hasn’t begun, and now the MTA is going to assume it from the Port Authority with an expanded scope, more dollars and a longer timeline. The Board’s Transit Committee will vote tomorrow. In fiscal terms, the MTA will increase the Phase 2 work to a total of $100 million; the money is accounted for in the 2010-2014 and 2015-2019 capital plans. The bad news is that this contract is set to last 36 months now. It’s possible the station could be back in revenue service before Phase 2 wraps, but it seems likely that Cortlandt St. will remain closed for the time being. All in, the station won’t reopen until over 15 years after 9/11. For such a key link to the World Trade Center site, that’s a big gap in service that won’t be restored yet. I’ve tinkered with the site a little today to bring some before and after images of the planned transit upgrades for the One Vanderbilt development. For background on the $200 million in expansion word SL Green is prepared to spend, make sure you check out my morning post first, and then come back here for some good ol’ before-and-after fun. All images in this post are courtesy of Kohn Pedersen Fox. These new street entrances will bring straphangers to and from the Shuttle platform along East 42nd Street. By narrowing columns and staircases as well as installing a new fare control area, developers and the MTA hope to improve passenger circulation in the cramped IRT mezzanine above the 4, 5 and 6 platforms at Grand Central. Narrowing columns will also create more space for subway riders waiting on the IRT platforms and computer renderings that look like Robert de Niro alike. Opening up unused mezzanine space will improve congested conditions. A new entrance from the Shuttle platform will provide direct access to One Vanderbilt for those entering the building. Toward the end of his third term, Mayor Michael Bloomberg unveiled an ambitious plan to rezone Midtown East for density. As part of the plans, the Mayor, consulting with the MTA, unveiled a few hundred million dollars worth of transit upgrades. These upgrades were Key in securing then-Manhattan Borough President Scott Stringer’s sign off and when the lame-duck mayor saw his rezoning dreams falter, I bemoaned the end of the transit upgrades. Less than a year later, though, the rezoning plans are provisionally back on the table, albeit in a different form that doesn’t concern us. The transit upgrades too have survived the transition to Mayor Bill de Blasio’s administration, and yesterday, SL Green in conjunction with the MTA and Kohn Pedersen Fox unveiled their $200 million plan for transit access in and around Grand Central. Their goals — to be completed by 2020 — will streamline passenger flow and expand space in a constrained area, and, most importantly, the costs will be borne by the developers. The project that developers and the MTA showed off yesterday is One Vanderbilt, a 65-story office building that will be open before East Side Access is scheduled to wrap. It will be directly to the west of Grand Central with multiple access points to the transit infrastructure below, and plans include closing Vanderbilt between 42nd and 43rd Sts. to vehicular traffic. the reopening of enclosed spaces to improve passenger flow on the IRT mezzanine. All in all, the improvements are a significant part of the $400 million the MTA and City had said they needed to spend when the rezoning efforts were first announced in early 2013. Although the MTA and SL Green recognize that community boards will still need to weigh in on this plan, transit advocacy groups and other interests are aligning in favor of the plan. “As a transit rider group, the Straphangers Campaign believes the proposed deal between SL Green, the City and the MTA holds much promise for improving the lives of millions of riders who use Grand Central Terminal. In October, the official land use process kicks in, with community boards, elected officials and the public getting a chance to have their say. We will be listening,” Gene Russianoff said. Others echoed these sentiments. “The public access points, escalators, and waiting area will be a tremendous improvement for Grand Central and East Side Aces and this private investment will ensure the public reaps the full benefit of this world class transit hub,” Jennifer Hensley, Executive Director of the Association for a Better New York, said. For now, we have promises and renderings. The streamlining of the columns alone are nearly worth the cost of the project, and the rest is just gravy. We’ll see when, if and how long this takes to come to fruition. When the MTA Board’s Transit committee meets later today, one of their agenda items includes a formal blessing of the unnecessarily controversial M60 Select Bus Servicer route. After months of planning, rollbacks and NIMBY opposition that highlighted the flaws with the process, the committee will vote on the reduced plan, and thousands of bus riders who need better service to Laguardia Airport and down 125th St. will get it. We can celebrate the moment, but it’s also yet another example of missed opportunities for relatively cheap and easy transit upgrade. The Board materials fill in the details. The new SBS M60 will be a 24-hour bus line that fully supplants the route’s current local service. (The remaining 125th St. crosstown local buses will continue to serve all stops.) 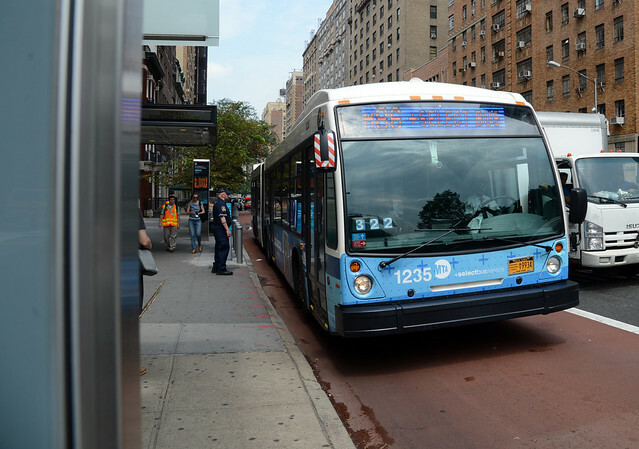 Service frequency will increase by 10 percent on the weekdays and around 14 percent on the weekends, and with a dedicated bus lane, for all 125th St. buses, that will run for a little less than one mile between Lenox and 2nd Avenues. The Board committee book describes the bus lane: “Most of the bus lanes will be offset, or one lane away from the curb, which will accommodate deliveries, community parking needs, and right turns; the bus lane between 3rd Avenue and 2nd Avenue will be curbside and only in the eastbound direction.” It’s better than nothing, but even as the MTA stresses that it and NYC DOT “attended over 50 community meetings,” I can’t help but feel this whole thing is another missed opportunity. As this new service gears up to launch in the spring, it is definitely an improvement so long as bus lane enforcement comes with it. Outside of the need to improve access to Laguardia, a bus ride down 125th Street is often an exercise in patience and futility. This wide cross-street is chock full of traffic stretching from Fairway on the West Side to the Triborough Bridge on the East. Parking and double parking are constant problems, and as with 96th St., it can be faster to walk at rush hour than to sit on a bus. With 125th St., the city could have taken the opportunity to rebuild the street space. The street is wide enough to support true BRT with center-running lanes and dedicated boarding areas. It has the ridership to warrant such improvements as well. Instead, Community Boards concerned with the loss of a few parking spots and one quarter of the local bus service threw up road blocks after road blocks to the point that the MTA and DOT never shelved the idea for good. Even after local politicians intervened, the plans are a watered-down version of the initial proposal, and parking will still obstruct the bus lane at certain points. Certain Community Boar members too are still unhappy with any plan that removes parking spaces and improves transit. So again, the needs of the few and loud outweigh the needs of the many, and we applaud the SBS M60 plans because they will exist in a few weeks. It will be easier for commuters, students and New Yorkers to journey down 125th St. and for travelers to reach Laguardia. For the airport, ultimately, though, what New York City truly needs is a direct subway connection, and for a cross-street, we need bus rapid transit. For now, we’ll just have to keep dreaming.